To continue our discuss of overwintering tropicals from last week, we will focus on the treatment for Canna, Alocasia, Colocasia, Xanthosoma, Hedychium, Alpinia is similar to that of bananas, but even easier. 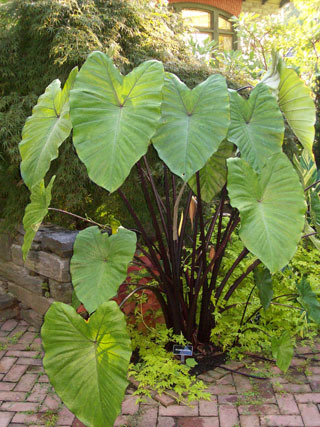 The elephant ears are fleshy tubers, while the Canna, Alpinia and Hedychium are rhizomes. They all can take a slightly harder frost. This comes in handy if you cannot harvest them immediately from the garden. I often do not have the time to get into the garden at the first frost to take care of all my garden chores. 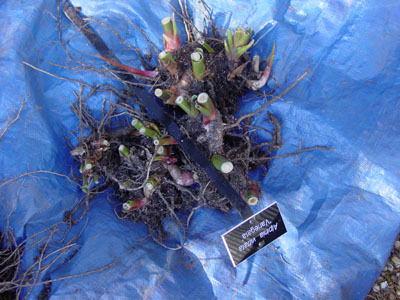 Several frosts will often kill off the tops of these plants without doing any damage to the tubers or rhizomes. Last year I did not harvest many of these until late November or early December and had no damage to the plants. With these, cut the foliage to the ground. Again, with a digging fork lift the tuber or rhizome out of the ground. Try to remove as much of the soil as possible. For cannas crates are easiest for over wintering because you often have a wide mass of rhizomes. If you cannot find a crate, a large plastic nursery pot will be fine. Just add a few inches of mulch then set in your tubers or rhizomes with the roots contacting the layer of mulch. Fill in around the cannas and tubers until the crowns of each are covered. You do not need to be too careful in this process. Basically the majority of the tuber or rhizome should be covered. I would try to keep the same cultivar in each container. Mixing of cultivars will only create confusion next spring. Follow Garden Seeds for the final installment on overwintering tropicals. I have found success storing canna rhizomes in flat boxes that grapefruit from Texas is shipped in. they often have a foam pad on the bottom unit and the top and bottom come apart so you can have two separate boxes and they slide easily onto the shelves in my dark, damp, creepy basement that is not useful for much of anything except storing tropicals at temps between 45 and 55 degrees. I generally hose off the soil and let dry for a few days before storing – I get about 98% survival during our zone 5 winter this way.